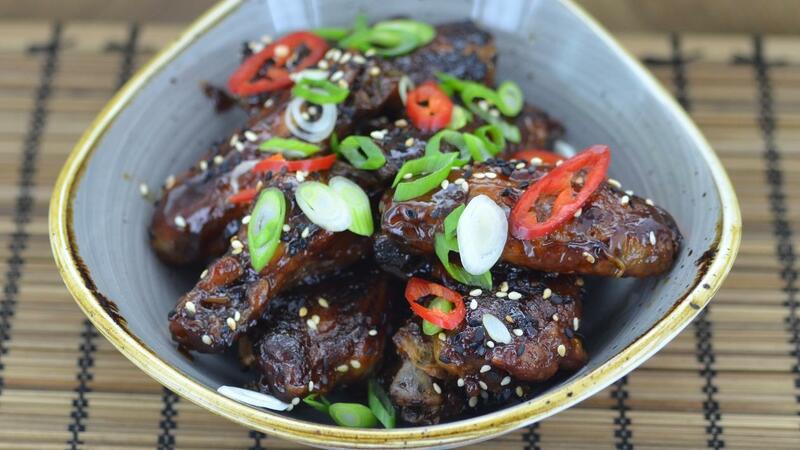 These chicken wings are sticky sweet and tender, and can be an accompaniment for a main dish or an appetiser. Minimise preparation time in your professional kitchen by using KNORR Professional Teriyaki Paste. Place the Chicken wings, sliced ginger, garlic cloves, star anise, in a deep semi gastronome tray. Cover with the vegetable oil. Place a sheet of greaseproof paper on top to ensure the wings remain submerged and cover with foil. Place in the preheated oven for 3-3 ½ hours or until the wings are tender and almost falling apart. Remove the cooked wings from the tray taking removing any excess oil and cool. In a pan combine the KNORR Teriyaki Paste, mirin and water and bring to a boil. Place the chicken wings on a lined gastronome tray and roast for 15-20 min. until golden and crispy. Brush the teriyaki glaze onto the wings thoroughly coating them. Roast for an additional 10 min. remove from the oven then brush with the remaining glaze. Garnish with sesame seeds, chopped coriander, chilli and spring onion.